Any event involves finding and securing different vendors, from florists to entertainment to caterers to calligraphers, and everything in between. Who you hire to be part of your big day can make the difference between a wild success and a major headache. Working with an event professional is a great way to make sure you hire the highest quality vendors. Your planner will likely already have connections with companies in the area that provide whatever services you need. And if not, he or she will know exactly which questions to ask before booking. That being said, not everyone has the means or desire to hire out this type of work. Often people want to DIY their event planning, but just don’t know where to start, and I’m here to help with tips and tricks on how to source and coordinate your event vendors for maximum success. This tip goes for pretty well any part of planning an event – not just dealing with hiring vendors. Getting started early gives you the time you need to iron out all the details. It also means you can spend time looking around instead of just booking the first company you speak to. And on that note, it’s almost always worth the time to look around a little bit. You can speak to multiple companies to do the same work, and find the best price for quality of service. Get online, or visit storefronts in person and ask for quotes. If you’re looking to hire someone for décor or any kind of design, you should also spend time researching the styles of each of the companies to ensure they reflect what you are trying to present. Ask to see samples or portfolio examples. Don’t be afraid to shop around! Whether you are juggling multiple companies and trying to decide which to go with, or if you’ve found the vendor of your dreams, try to schedule an in-person or phone meeting to make sure your representative is someone you truly want to work with. This is especially important in the case of hiring an event planner; this person will be making decisions on your behalf, so you need to trust him or her, and you need to be on the same page. Any vendor you hire should make your planning easier, not more difficult. Throughout the entire process of hiring and coordinating your vendors, some of the greatest advice I can give is to be specific. Be clear about what you are looking for, your expectations, and your timelines. Prices quoted by any type of company may not be accurate if you don’t let them know exactly what it is you want and how much time they’ll have to deliver. As soon as you’ve made your decision on who to hire, ask for a contract and get your event booked right away. You don’t want to do the research and agonize over the decision, only to find they’ve given your date to another client already. If you’re up front about your process, this is unlikely to happen, but get everything finalized as soon as you can, even if it’s just for peace of mind. Once you’ve got all of your vendors booked, you’ll want to make sure no wires get crossed. I usually like to send an email to each company including everything you’ve discussed during the process of booking. They may already have different conversations and documents outlining all the information, but this email ensures they have everything in one place. Obviously what is included will be very different for a photo booth company compared to someone who is designing your invitations, but the concept remains the same. If all the information they need is in one clear, concise email it’s easy for the vendor to do their job, and this does the double duty of bringing up any questions that may not have been clarified during the booking process. Dealing with any possible issues ahead of time instead of the day of the event is always preferable to being blindsided by something. About a week before the event, send out an updated email to each of your vendors confirming your instructions and making note of any changes. This confirmation is key because it’s a reminder of the important details you’ve previously discussed, and an opportunity to come up with solutions to any issues that have developed. Keep yourself (or, you know, whoever is handling your set up and execution) sane on the day of the event. Make a timeline including information on all of the physical vendors that will be showing up at the venue, or making deliveries. This part of event planning is something that I specialize in – creating a document that outlines necessary details for who is showing up when, and who is going to meet them. On the day of the event, you should not be running through emails trying to figure out when your florist is going to show up with centerpieces, or when the band is arriving for sound check. You should be keeping all the brain power you can to deal with troubleshooting any problems that arise throughout the day. As far as what is happening when, you should just be following the timeline that you set up previously (way to go, past you!). The best advice I can give about sourcing and coordinating your event vendors is to do the research and to communicate with them clearly throughout the entire process. By doing these two things, you will be selecting the correct vendors for your event, and making sure they know exactly what you are hiring them to do, which will minimize any issues during the day of the event. Happy planning! Want your event to be a wild success? I can provide you with tips, tricks, and downloadable resources to guide you through the crazy journey you are embarking on. 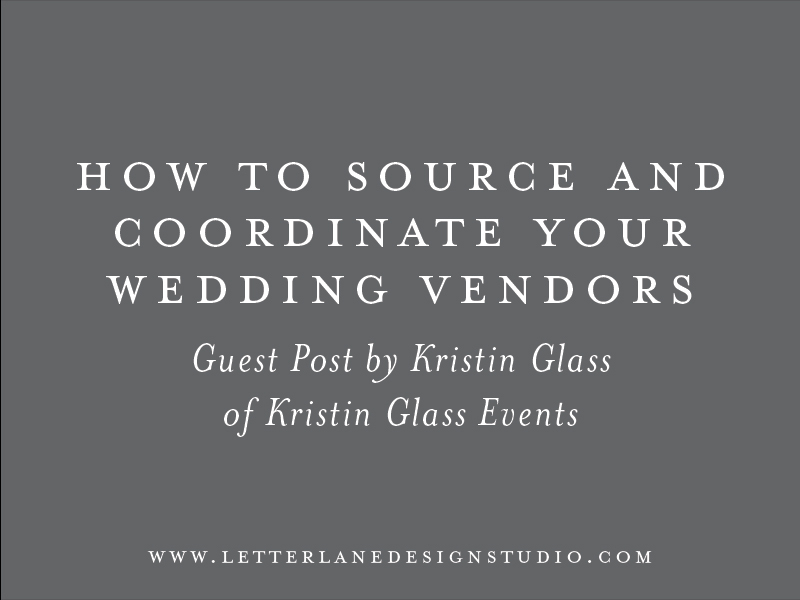 I’m an event planner and blogger over at KristinGlassEvents.com, and I have experience working on a great range of gatherings from weddings, concerts, and fundraising galas to golf tournaments and professional sports games, and everything in between. Let me help make your event planning easy. Have a question for Kristin? Maybe a suggestion for a blog topic you'd like to hear about? Please feel free to leave a comment below! I would love to hear from you! INTERESTED IN GUEST POSTING FOR LETTER LANE? Click here to view my guest blogging guidelines.